Cook pasta according to the instructions on the bag. Meanwhile, heat oil in a pan and cook the chicken for 2-3 minutes on each side until browned. Remove from pan and cut into stripes - the chicken is probably not quite done yet at this point - if that's the case just return the stripes to the pan for a few more minutes until done. Remove from pan and set aside. Add a bit more oil to the pan and cook garlic and chili flakes until fragrant - about a minute or so. Add white wine and scrape the pan to get all the deliciousness off the bottom of it. Add chicken broth, cream, sundried tomatoes, parmesan cheese and salt and pepper to taste. Bring to a boil, then reduce the heat and let it simmer for a few minutes. 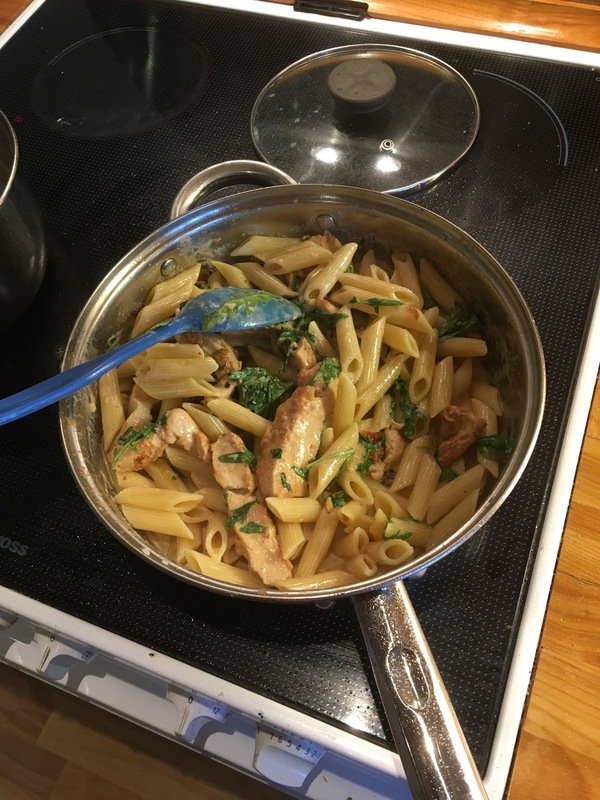 Return the chicken to the sauce, add the rocket salad and basil and stir until it's just wilted. SO good!! As in close-to-restaurant-worthy good! Definitely something I'll make again. 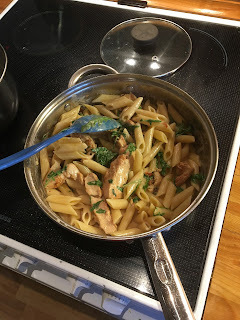 I wouldn't have minded a bit more sauce, and will probably add more sundried tomatoes and rocket salad to the sauce next time, but even just as-is it turned out to be one of the best pasta-dishes I've made in a long time. Fortunately we had leftovers :-D I've already claimed those for myself.